Sadly, we are again asking for donations to the IAM Disaster Relief Fund. This time, it’s to help our brothers and sisters in and around Joplin, MO, which was devastated by the May 22 killer tornado. One of the deadliest tornados in U.S. history touched down just outside of Joplin, ripping through the densely-populated city. The ¾-miles-wide tornado packed winds up to 198 mph, leaving 117 people dead and more than 1,000 injured, with those numbers expected to climb as rescuers continue their work. Please give what you can to the IAM Disaster Relief Fund. All monies will be distributed directly to IAM families on the basis of need. Checks (in any amount) should be made payable to: IAM Disaster Relief Fund, and mailed to: IAM Community Services Department, 9000 Machinists Place, Upper Marlboro, MD 20772. Any questions should be directed to Department Director Charlie Micallef at 301-967-3433, or email at cmicallef@iamaw.org. 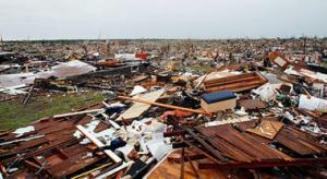 Just last month, more than 300 twisters tore across the Southern United States, killing more than 360 people. So far this year, 482 people have been killed by tornadoes, putting the nation on track for its worst year ever.